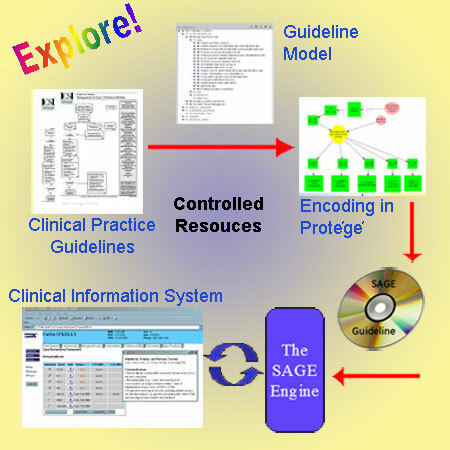 The SAGE project is a collaborative research and development project to develop a standards-based comprehensive technology infrastructure that will enable encoding and dissemination of electronic clinical practice guidelines. Health care organizations throughout the country can deploy those guidelines easily within any standards-conforming clinical information system. The SAGE infrastructure combines the best available informatics standards with innovative guideline deployment technology to support encoding and dissemination of both simple and complex guidelines - spanning a breadth of clinical domains including acute care, chronic care, and clinical trial protocols. SAGE guideline deployment technology presents guideline content to clinicians through active, patient-specific recommendations (such as reminders, order sets, care plans) surfaced through functions of the local clinical information system, and integrated into the care workflow.